Orchidmania: Good luck, bad vibe? A newly-found orchid species in Vietnam is making billionaires crazy, lusting for the Dendrobium farinatum, the new species believed to bring good luck to the owners. It was found in the Khanh Hoa eco-region in the central region of Vietnam. Truong Quang Tam from the Tropical Biology Institute confirmed that the orchid species is indigenous to Vietnam alone. According to Dr Nguyen Cong Thoai, a specialist in genetics, the orchid species was first mentioned in a journal published in Germany in 2004. In an article, H. Schildhauer and W.Schraut wrote that the orchids were sourced from Vietnam, which were then imported to Germany with commercial purpose. 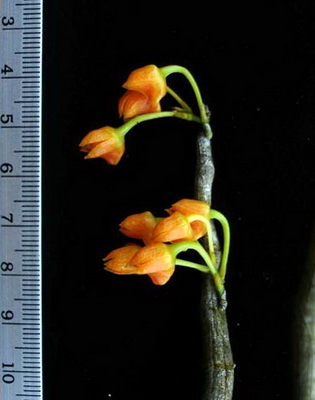 The article said that it was still unclear about the origin of the orchids, but it is believed to be found in Lai Chau province in the northwest of Vietnam. orchids have been recognised formally in the natural environment in Vietnam. The collected orchid samples bloomed in July. Researchers are now carrying out surveys on the location and eco-region. Their findings could help solve how to protect and develop the species. There have been rumours that the orchids can bring good luck and help the owners overcome misfortune. Billionaires in HCM City have been hunting for the orchids throughout the country, and are happy to splurge their cash. Some of them have even paid a deposit to traders to ensure that they would get the orchids one day. Elsewhere, folk are claiming the orchids can treat diseases – and that tea from the dried orchid petals are rejuvenating. Sounds rather sinister to me.